When I had my Amiga computer as a child I loved playing dungeon crawlers. It all started with Dungeon Master, an excellent game that I spend many hours playing. Probably my favorite series of them all was Eye of the Beholder which played in the Dungeons and Dragons world and was great fun to play. Well, they went a bit overboard in the third part of the series in my opinion but still, a great game all in all. I recently bought Legend of Grimrock which reminded me a lot about those games. Moonshades is a game that you play in your web browser that offers a similar gaming experience. It has been released as an early alpha build which looks great and plays even better. Sure, there are a couple of things that could be better, but all in all it shows great promise. Just look at the screenshot below to see how it looks like. When you open the main page that I linked above you have the option to start with a premade party, or create a custom party. I suggest you create a custom party. While it may take longer to get started playing the game, you get better control over the party members. Character creation is currently limited to the three races human, dwarf and fallen, and the five classes fanatic, heretic, paladin, warrior and sorcerer. You can pick an avatar for each party member that you create, distribute points into power, dexterity, defense and vitality, and enter a name to get started. Once you have created your party or picked the default party you are thrown into the dungeon. The first couple of minutes act like a tutorial that explains key concepts to you. You move your party around with the WASD and QE keys or by clicking on the icons on the screen. You also get a couple of items which you need to equip your characters with. This includes weapons, some armor and usable items. To do so click on any character to display that characters inventory, equipped items, spells and abilities. I'd also recommend you to move the available skills to the skill slots below the character portraits so that you can activate or use them whenever the need arises. This is especially important for characters in the second row and for healing for instance. About healing. You need to select the spell first and then double-click on the target. This may be important during the first encounter of the game as you may very well end up with a dead character otherwise. Please also note that you can equip two one-hand weapons which greatly increases the damage output of the character. 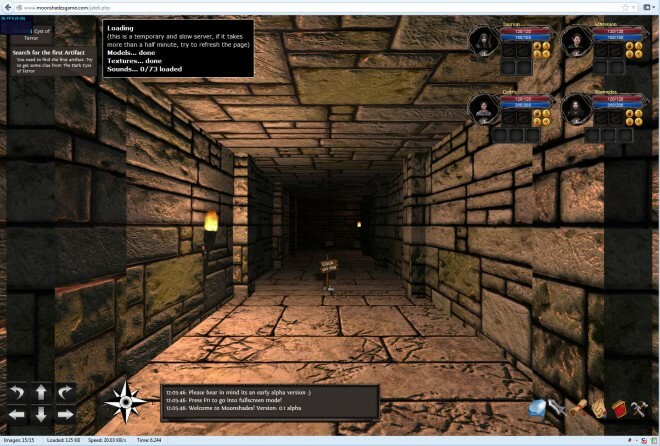 The game features light puzzles, like finding a key or password that you need to enter to go on, or teleporters which teleport you to another location in the dungeon. A level up gives the character another skill point to spend as well as ten additional points in attributes. Note that mana regenerates automatically, while health does not. Here is a video of Moonshades which provides you with a quick overview of how the game plays and looks like. Moonshades is an impressive project that brings a first person dungeon crawler in the style of the Eye of the Beholder or Legend of Grimrock series to web browsers supporting WebGL. Highly recommended for anyone who likes roleplaying games, dungeon crawlers and fantasy settings. I need more… MORE I TELL YA!!! Next pot of coffee I’ll be considered columbian… xD I’m saturated to the bone.